The social media darling, Facebook Inc (NASDAQ:FB), is poised to open up 2016 with a bang when they report first quarter earnings this evening. Unlike its peer, Twitter and LinkedIn, the Mark Zuckerberg led company has lived up and even surpassed all of its expectations. 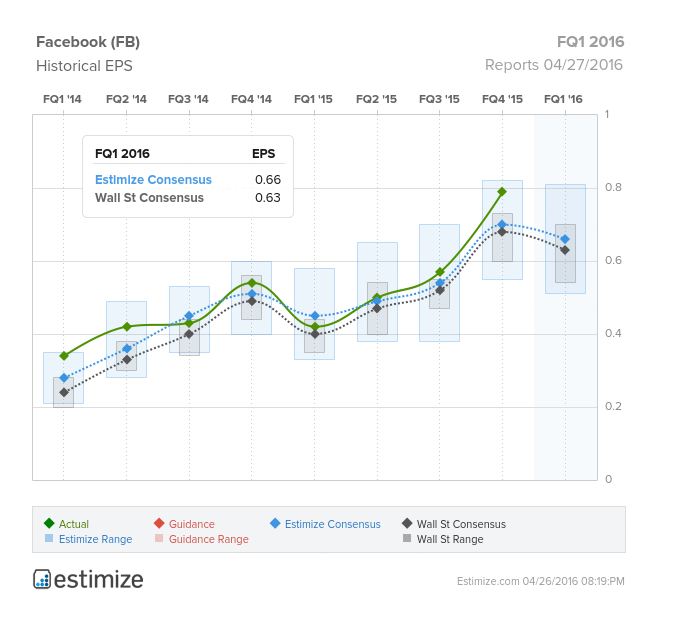 Sure enough, Facebook earnings have steadily increased, beating in 3 of the 4 quarters in fiscal 2015. The stock has largely tracked earnings and is now up 35.04% on the past 12 months. Given Facebook’s track record, it’s not surprising that earnings have been on the move. In the past 3 months per estimates have risen 12% on 6% increase in sales. Therefore, the Estimize consensus is calling for EPS of $0.66 on 5.31 billion in revenue, 3 cents higher than Wall Street on the bottom and $80 million on top. This indicates earnings per share growing 57% compared to a year earlier while revenue could grow as much as 50%. Facebook is firing on all cylinders and is anticipated to be one of the bright spots this earnings season. Last quarter, Facebook reported 1.59B monthly active users (MAU), a resounding 14% YoY increase. This is crucial in the industry because a stronger social network leverages more opportunities for valuable interactions, user growth and revenue. Compared with its peers, Twitter and Linkedin, Facebook is far ahead in both MAUs and DAUs. Facebook has also developed an interest in growing internationally. Despite lower revenue per user in emerging markets, Mark Zuckerberg has been drawn to expanding in India, home to more than one billion people. By reaching a larger audience, Facebook’s instant ads will create more value for advertisers. However, FB no longer relies solely on ad revenue and has expanded its ecosystem to services and applications. Notably, Facebook’s past acquisitions of WhatsApp, Oculus Rift, and Instagram have performed remarkably well, with Oculus Rift shipments just beginning last month. Facebook is also looking to take on peers such as LinkedIn with “Facebook at Work” and Yelp’s local business and services platform. The past handful of years have been nothing short of a roller coaster for the solar industry. All the strides to promote solar energy and make it more accessible has not translated to financial success. First Solar, Inc. (NASDAQ:FSLR) has been the true anomaly and is coming off three consecutive quarters of beating on both the top and bottom line. The company has continues to outperform the rest of the solar industry with an effective business model, sound strategy and of course, good earnings. The Estimize consensus is calling for earnings per share of $0.91 on $930.07 million in revenue, 4 cents higher than Wall Street on the bottom line and $21 million below on the top. Since its last report, per share estimates have increased 63% with revenue up an additional 5%. By comparison, profits are expected to increase 2.5 times while sales are looking to almost double. 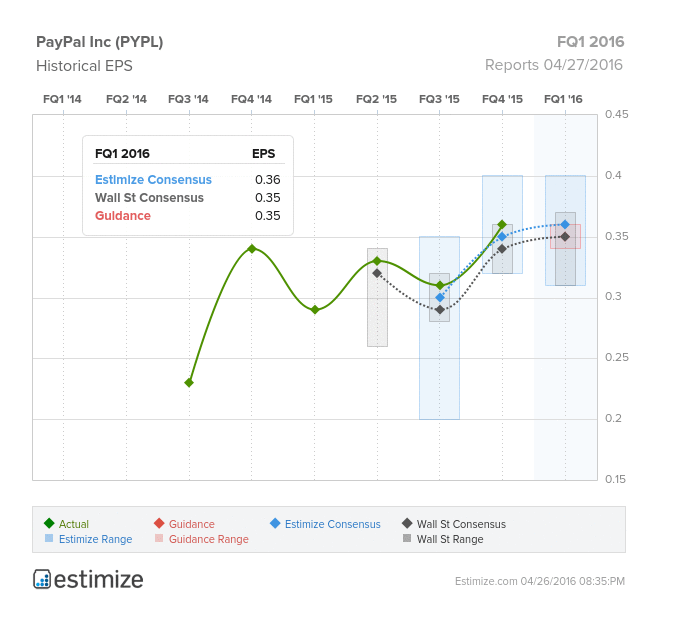 It’s not surprising that the stock tends to move leading up and through earnings season. On average, shares increase as much as 7% 30 days ahead of earnings and slowly taper off to 2% in the 5 days following results. Overall though, the stock has been on a slide and is now down 20% on the past 12 months. First Solar continues to make impressive strides compared to some of its peers including SolarCIty and SunEdison. 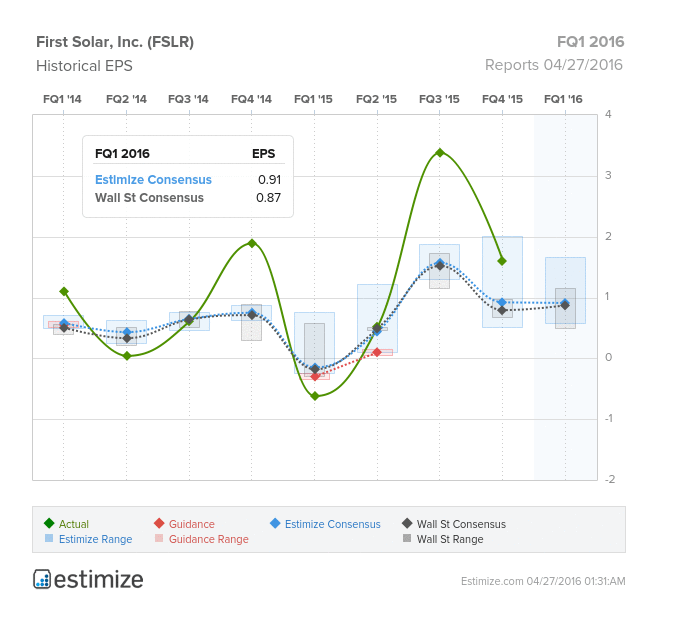 From a financial perspective, First Solar is one of the few solar companies that hasn’t consistently posted a loss. As a result the stock hasn’t been hit as hard as the above companies, whose shares are down almost 50% since this time last year. There are questions around how solar power will fare now that oil prices seem to be stabilizing. First Solar has plans to expand internationally, aggressively pursuing projects in emerging markets like India and Souh Africa. Meanwhile, First Solar’s superior balance sheet and a healthy backlog has bolstered its competitive advantage. Digital payment platform, Paypal Holdings Inc (NASDAQ:PYPL), is scheduled to report first quarter earnings today, after the market closes. PayPal is best known as the brainchild of famed entrepreneur Elon Musk and former subsidiary of eBay. But in fact, PayPal offers a full suite of payment solutions and is slowly surfacing as the clear winner in the rapidly growing digital payments space. Almost a year removed from eBay, PayPal has fared much better than eBay which continues to falter. The stock is up 8.23% in the past 12 months and almost 10% year to date. The company has also beat in its first 3 publicly reported quarters and appears on track to make it a fourth. The Estimize consensus is calling for EPS of $0.36 on revenue expectations of $2.51 billion, 1 cent higher than Wall Street on the bottom line and $8 million on top. Compared to a year earlier, profits are expected to grow 23% on a 19% increase in revenue. Given PayPal’s recent history, it is not surprising that the stock is a big mover throughout earnings season. On average the stock increases 2% through the day before earnings and can climb as high as 7% in the 5 days post earnings. PayPal’s suite of digital payment solutions has performed remarkably well in the past since its spinoff from eBay. PayPal is responsible for technology platforms like Venmo, Braintree and Xoom to name a few. Venmo has gained traction amongst millennial users while Braintree is being incorporated into various ecommerce platforms. Braintree was also recently integrated with FB messenger to easily send funds between Facebook friends. Meanwhile, PayPal continues to onboard new merchants with the most notable being Alibaba. PayPal is also in talks to partner with Visa, which would propel the company even further in this digital space. On the downside, PayPal faces threats from on its credit offerings. PayPal current offers two forms of credit, PayPal Credit, formerly Bill Me Later, and Working Capital. These platforms extend a credit line to consumers and also offer cash advances to small business. Last year the company provisioned $385 million in loan losses which it expects to increase throughout fiscal 2016.